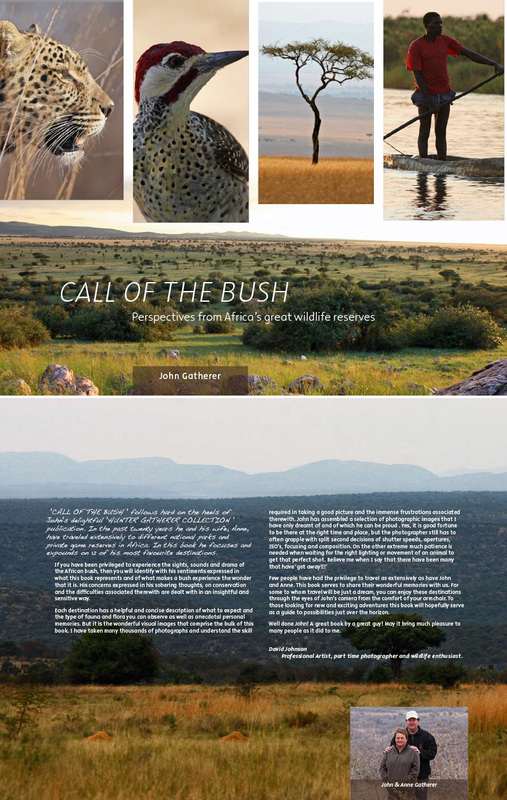 ‘CALL OF THE BUSH’ follows hard on the heels of John’s delightful ‘HUNTER GATHERER COLLECTION’ publication. In the past twenty years he and his wife, Anne, have traveled extensively to different national parks and private game reserves in Africa. In this book he focuses and expounds on 12 of his most favourite destinations. If you have been privileged to experience the sights, sounds and drama of the African bush, then you will identify with his sentiments expressed in what this book represents and of what makes a bush experience the wonder that it is. His concerns expressed in his sobering thoughts, on conservation and the difficulties associated therewith are dealt with in an insightful and sensitive way. Few people have had the privilege to travel as extensively as have John and Anne. This book serves to share their wonderful memories with us. For some to whom travel will be just a dream, you can enjoy these destinations through the eyes of John’s camera from the comfort of your armchair. To those looking for new and exciting adventures this book will hopefully serve as a guide to possibilities just over the horizon. Well done John! A great book by a great guy! May it bring much pleasure to many people as it did to me.